This wreath is a beautiful Autumn display to welcome in the Fall Season. This wreath features many of the elements that make up the beauty of the Fall season. . It is made on a grapevine wreath and has a spray of fall leaves, sunflowers, corn, berries, pumpkins and pine cones while still allowing glimpses of the grapevine wreath beneath it. .Adorned with a beautiful bow featuring 7 different wired ribbons in fall colors. 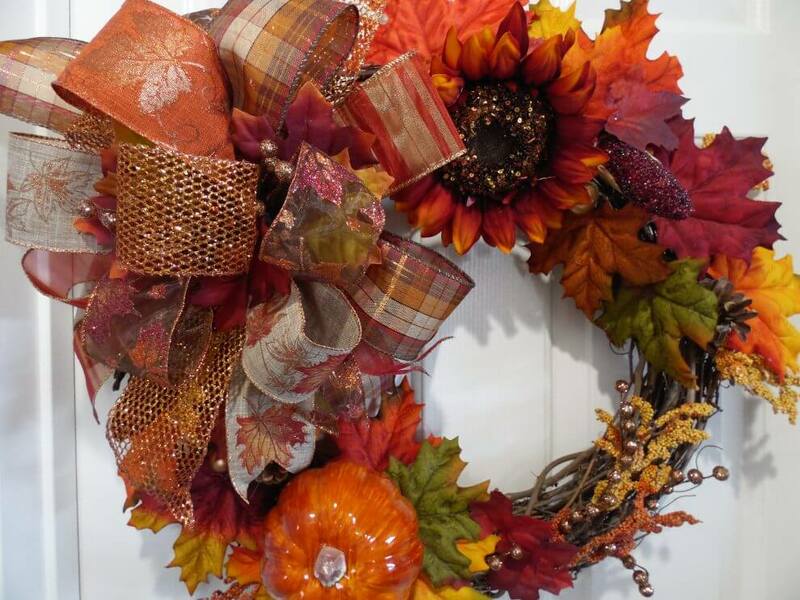 It is 23″ in diameter and would be gorgeous on your front door, or in your home to celebrate Fall and Thanksgiving. Like this but it doesn’t match your decor? Need a different color? Please message me and we can work on something unique just for you. All my wreaths make great gifts! If you wish to purchase this wreath as a gift, I will be happy to include a hand-written card to the recipient which adds that personal touch. It is recommended that this wreath if placed outside is under a covered porch or awning to protect it from the elements. All wreaths are made in a smoke free, pet free home. I can customize your order if you are looking for something specific, please message me.